It's not only adults that enjoy thrills and spills and the Frog Hopper is perfect for the younger members of the family to experience their first "pink knuckle" ride. The Frog Hopper is quite mobile and often hops around the park but it can usually be found on its lily pad, which is currently in front of theCloud Cuckoo Land theatre. After the closure of the short-lived Nickelodeon Outta Control, the park added Frog Hopper to Cred Street during the 1999 season to fill the gap left by the closure of its signature attraction. The ride, a familiar sight from fairgrounds across the world, was added as a low-cost and quick fix to the children's ride line up and retained its "off the shelf" appearance for its first 10 years in the park. 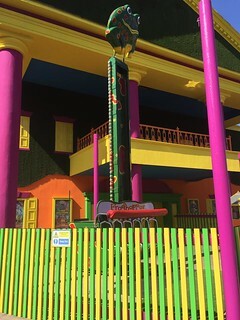 It was not until the arrival of Cloud Cuckoo Land in 2009 when it received a much-needed repaint to help better fit the area. The ride is portable and so during its time in the park has often moved for special events and has operated at the hotels and also Towers Street (in 2014) during the resort's Christmas events. In 2017, the ride was relocated to sit in front of Cloud Cuckoo Land's theatre, which is currently SBNO.